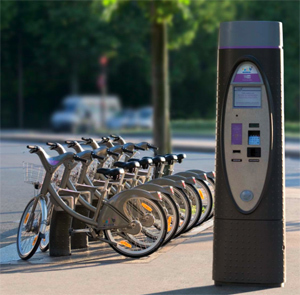 Bikes can be rented for pre-paid amounts of time ranging from 30 minutes to one week, and then dropped off at any kiosk. In the first year alone, more than 27.5 million trips, representing an average of 120,000 trips per day, significantly reduced car congestion and earned the city more than $31 million in revenue. This successful concept has already been transported to Barcelona, Mexico City, London and Washington, DC. and NYC is now in test mode on its own program that will encompass 600 stations in Brooklyn and Manhattan and 10,000 bikes. Now we’re moving! Excerpted from The New Rules of Green Marketing: Strategies, Tools and Inspiration for Sustainable Branding (Berrett-Koehler 2011) by Jacquelyn A. Ottman. Ottman is an expert adviser on green marketing to Fortune 500 companies and the U.S. government. Her firm’s website, containing more information about the book, is http://www.greenmarketing.com. 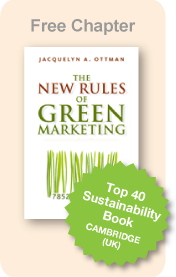 Subscribe to Jacquie Ottman’s Green Marketing Blog by linking here. Learn more about Ottman’s new workshop, “Profiting from the New Rules of Green Marketing”, here.